June 1st - 6:30 p.m.
Trooper Chris Lanham will speak to us about the upcoming Trooper Island program. Will discuss his participation on the U.S. Olympic Basketball Team in the Munich games. Glen Kleine, Lt. Gov of Division 9 and former president of the Kiwanis Club of Richmond, was the grand prize winner of the Kiwanis International Photo Contest and received the above certificate signed by Jack Brockley, Managing Editor of Kiwanis Magazine and Director of Publications and Eyjolfur Sigurdsson, Executive Director of Kiwanis International. Kleine submitted six photos taken of Richmond Kiwanis related activites throughout the year. He thought a photo of one of the club members wearing the bright yellow Richmond Kiwanis t shirts might be singled out for some recognition because of its publicity value for Kiwanis. He thought the photo of club president Piddle Johnson doing face painting at the YMCA/Kiwanis Fall Festival might be in the running. Instead, he was surprized to find that a photo of the grandson of long-time Richmond Club secretary, Danny Damrell, was singled out for distinction. Brockley wrote to Kleine, "Congratulations! Enclosed you will find your certificate where we officially recognize you as the Grand Prise and 1st Place Winner of the 2003 KIWANIS Magazine Photo Contest. ... On behalf of Kiwanis International I wish to thank you for participating on the KIWANIS Photo Contest. It is an honor for us to publish his photo in the June/July 2004 KIWANIS Issue." Mac Wall, CEO and Executive Director of the Kentucky Educational Television told Kiwanians about the impact of television on the lives of everyone in the commonwealth. He also discussed the future of television and the changes it will have. He noted that Congress has approved moving it from its present spectrum to an area of the spectrum more useful to digital television. (Click here for more information about KET and Digital Television). He indicated that the area of the spectrum assigned (represented by a clear tube), would either accomodate the red block which represented HDTV or it could accompdate four times as much traditional content provided by KET plus specialized medical and other content . KET currently operates16 analog and 16 digital transmitters across the state. Incidentally, Mac said he learned about service as a member of Circle K. You may reach Mac at mwall@ket.org. Erin Rosacker, Program Coordinator for the Richmond Department of Parks and Recreation, recently spoke to the Kiwanis Club of Richmond describing the various activities to be provided by the department during the summer and fall. She also described the new facilities currently under construction including the Phillis Adams Little League Ballfield. Adams, a Richmond Kiwanian, is the long-time committee chair of the Richmond Little League. May 31 - 7:15 a.m.
June 1 - 7:00 p.m. Rain Site: Richmond Area Arts Council, 299 West Water Street - 7:30 p.m.
For Children ages 6 to 9 - Maximum of 30 children. Phone 859-623-8753 to find out details on registration of children. Birth certificate required at time of registration. June 11 - 7:00 p.m.
June 15 - 7:00 p.m. Call 623-555 ext 13 to find out which film is showing. For Children ages 10 to12 - Maximum of 30 children. Phone 859-623-8753 to find out details on registration of children. Birth certificate required at time of registration. June 29 - 7:00 p.m.
July 1 (Thursdays in July) - 10"00 to 11:00 a.m.
Arts and Crafts, Games and Activities, Water Games and More. Phone 859-623-8753 to find out details on registration. July 8 (Thursdays in July) - 10"00 to 11:00 a.m.
July 13 - 7:00 p.m.
July 14 - 1:00 to 3:00 p.m.
July 15 (Thursdays in July) - 10"00 to 11:00 a.m.
July 27 - 7:00 p.m. Mid July - 6:30 p.m.
July 22 (Thursdays in July) - 10:00 to 11:00 a.m.
July 29 (Thursdays in July) - 10"00 to 11:00 a.m.
August 10 - 7:00 p.m. Mid August - 6:30 p.m.
September 11-12 - 10:00 a.m. To 5:00 p.m.
September 15 - 6:30 p.m.
October TBA - 6:30 p.m.
October 31 - 11:00 a.m.
December 1 - 15 - 6:00 to 8:00 p.m. Mid December - 6:30 p.m.
December 14, 16 - 6 to 9 p.m.
Beth Thompson, representing the Richmond Kiwanis Club, presented a $200 check to Ron Hamm, Senior District Executive for the Kit Carson District Bluegrass Council Boy Scouts Of America. This presentation was made at the Court of Honor for Richmond Troop 118 which meets at St. Mark's Church. This is part of the funds budgeted by the Richmond Kiwanis Club to support the Friends of Scouting campaign. 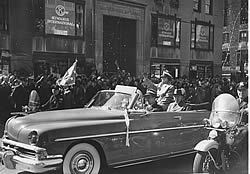 Early in 1951, Chicago held a parade for retiring General Douglas MacArthur, and employees of Kiwanis International Headquarters (then located at 520 North Michigan Avenue) had a perfect view of the parade as it rolled southward, immediately in front of the McGraw-Hill building. Note the Kiwanis emblems in the windows behind the general's car. Many Kiwanians, including several from Canada, came to the office to get a good view.